On Tuesday the Wall Street Journal reported on a secret payment os $400 million in cash in an unmarked plane to the Iranian regime in January. The payment coincided with the release of four detained Americans. The secret payment was captured on video. 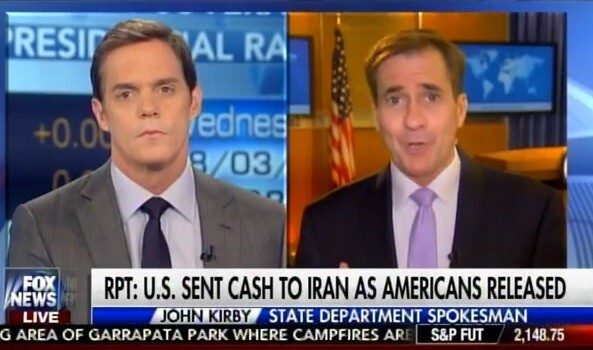 On Wednesday morning State Department Spokesperson John Kirby lied and said the Obama administration had already talked about this payment. John Kirby: As the president said at the time. And we spoke about this at the time that now that the prisoners released, now with the Iran deal done, it made no sense for us to drag out this claim so we settled this. Bill Hemmer: You said you spoke about that at the time, right? John Kirby: I did, absolutely. I did, Secretary Kerry did, the president did. Bill Hemmer: February 17th… There was no mention of a cash payment that day by the president. Bill Hemmer: But this is clear that this was not made public. And it appears it was kept secret. And it appears, sir, that it smells. When you see video at night of an unmarked jet with pallets of Euros and Swiss francs being unloaded. It looks bad and it smells. John Kirby: What I can tell you is the president spoke about this in January, I spoke about this, what happened here and why it happened. Bill Hemmer: …The Iranian press reported on this as a ransom payment. Are they wrong? John Kirby: It’s absolutely wrong, completely wrong. Look, you can believe us who talked about this on camera and on the record since January or you can believe an unnamed anonymous defense official from Iran. Sadly, John, the Iranian regime is more honest than you.